Go one exit pass the Hwy. 76 exit is the Bus. 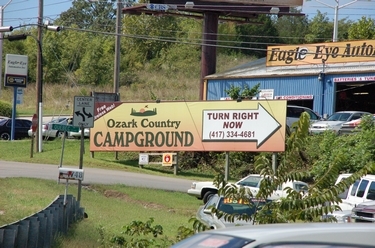 65 exit for College of the Ozarks, exit and turn right on Bus. 65 to the light, you will be facing the College of the Ozarks, turn left at that light which is Hwy. 165. FollowHwy. 165 about 5 miles across the Dam. Go 2 1/2 miles from the dam to our sign on the left. Turn left at our sign and go 1/2 mile back, campground is on the left. A hint: once you pass the Welk Theater and the Shell gas station by Sunterra Fall Creek, get in the left turn lane to prepare for the turn left. On our south corner is Eagle Eye Automotive on the north corner is a small car lot, turn between them. Turn left onto Hwy. 265 follow to Hwy. 165 turn left on 165, take it around the lake across the dam to the light just past the dam be sure to turn right to stay on 165. Go 2 1/2 miles from the dam to our sign on the left. Turn left at our sign and go 1/2 mile back campground is on the left. get in the left turn lane to prepare for the turn left. On our south corner is Eagle Eye Automotive on the north corner is a small car lot, turn between them. You may take Hwy.76, go 4 miles to Hwy. 165 at the Titanic Ship, turn south on 165 at the light, go for 2 1/2 miles to Quebec Dr. at our sign, turn right, go 1/2 mile to campground on left.